Israel has dismissed an offer by Palestinian militant groups to stop firing rockets into Israel, if Israel ends attacks on Palestinians. An Israeli government spokeswoman, Miri Eisen, said the militants had offered only a partial ceasefire. She said the offer of an end to firing rockets from Gaza showed a lack of real commitment to peace. The conditional Palestinian offer was made after a meeting on Thursday of all armed factions, including Hamas. The militant group Hamas leads the Palestinian Authority. Israel has in the past consistently rejected ceasefire offers by Palestinian militants, saying it refuses to do deals of any kind with what it describes as terrorist organisations. Palestinian Qassam rockets are fired into Israel on a daily basis. They have killed two Israelis in the past 10 days. 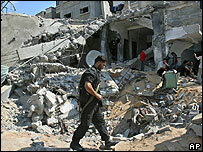 Israel has launched frequent ground offensives into Gaza Strip to try to stop the militants who launch the rockets. It has also shelled targets in Gaza heavily. Israel evacuated its settlements and military bases in Gaza last year, but the military renewed ground operations after militants captured an Israeli soldier in a border raid in June. Since June, Israeli troops have killed more than 400 Palestinians in Gaza, roughly half of them civilians. Three Israeli soldiers have died in operations and two civilians were killed by rocket fire. On Thursday, at least five Palestinians were killed by Israeli military action in the Gaza Strip as troops pressed on with operations against armed groups. Two militants were killed in an air strike in Beit Lahiya and two others died in armed clashes with troops. Another man was also shot dead. The deaths came as a 57-year-old female suicide bomber attacked Israeli troops in Jabaliya. Three Israeli troops were slightly wounded in the blast. The Israeli army says that a group of soldiers became suspicious of an approaching woman. They threw a stun grenade at her but she managed to detonate explosives that she was carrying. 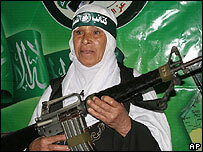 Governing Palestinian party Hamas claimed responsibility for the attack by the bomber and named her as Fatma Najar, a mother and grandmother.